Like most of the South Pacific nations, Vanuatu consists of a number of islands. One of the most visited of these islands is Efate Island. Efate Island is not only home to the country’s capital, Port Vila, but also home to one of the best blue lagoons in the world. So as a visitor to this scenic nation, it only makes sense to leave, even for a day, the bustling city of Port Vila and take a trip to the spectacular Vanuatu Blue Lagoon, which is just an hour-and-a-half drive from the city. 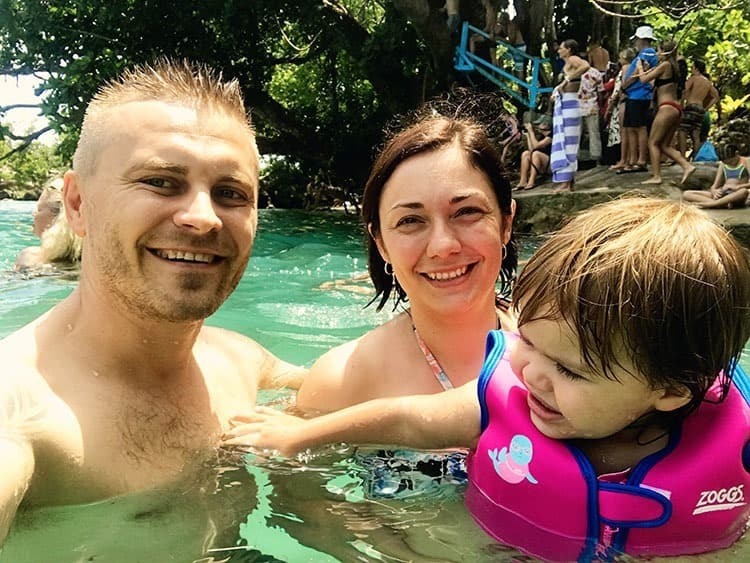 Please press play to watch our short video of our time at the gorgeous Blue Lagoon in Vanuatu. Find everything that you need to know to help you plan your trip to the Vanuatu Blue Lagoon. 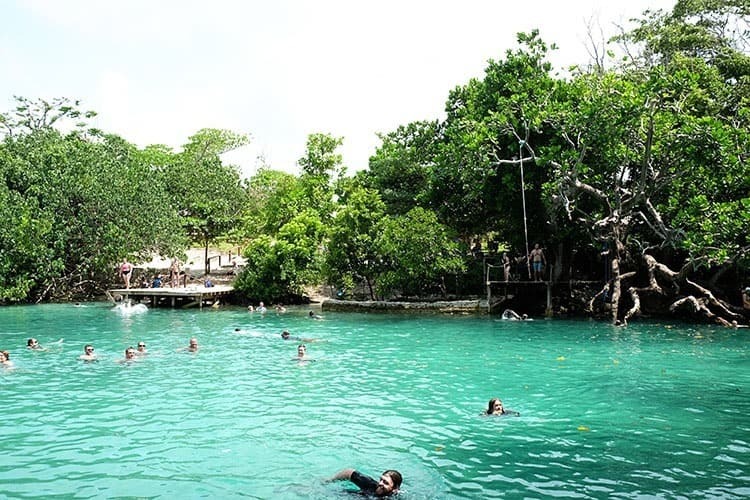 Situated on the eastern part of Efate Island, the Blue Lagoon Vanuatu is a large swimming hole measuring about 60-70 meters long and 30 meters wide. The Blue Lagoon is located next to the sea making it uniquely salty at high tide and fresh at low tide. Better still, the lagoon is surrounded by lush natural gardens and can be best enjoyed when the sun is shining as the clearness of the water enables you to see virtually everything to the bottom, which is approximately 6 meters deep. As the capital city of Vanuatu, Port Vila is home to the nation’s international airport, as well as where all large cruise ships dock. So once you land or dock in Port Villa, it’s advisable that you set aside half-a-day and plan to visit the stunning Blue Lagoon. If you are staying on Efate Island you might like to hire a car so that you can drive around the island – and make a stop at the Blue Lagoon. You can find our blog post on a one-day around-the-island road trip itinerary here. However, if you are stopping by on a cruise, we highly recommend that you simply head off on a tour instead. There are many car rental companies in Port Vila. Renting a car for a day may cost you about $60 (80 AUD), but it’s certainly worth it. The drive will take you around 1.5 hours. Important to note that there is no public bus on Vanuatu that you can take you to the Blue Lagoon. So you will need to negotiate and organize your own driver for the day, or alternatively join an organized tour. An option is to book a driver for the day. The drivers are great as they also act as your unofficial tour guide. You can also save costs by booking a minivan with some other travelers. Be aware though that most cars/vans in Vanuatu are not really in the best condition and you won't normally find aircon in the cars, so make sure to have a look at the driver's vehicle before you settle on a deal. You can also sign up for a tour, which in most cases involve an around-the-island day tour. The only problem with this arrangement is that you may not get the time to enjoy the Blue Lagoon as much as you’d want because the tour isn’t exclusively meant for the Blue Lagoon. – The Round the Island Tour: A very popular 8-hour tour. This tour includes a stop to see some traditional dance and fire walking in Iarofa Village, a swim in the Blue Lagoon, a buffet lunch, as well as a visit the Survivor Beach, Gideon’s Landing, Pangpang, and Eton Village. Click here to check prices. 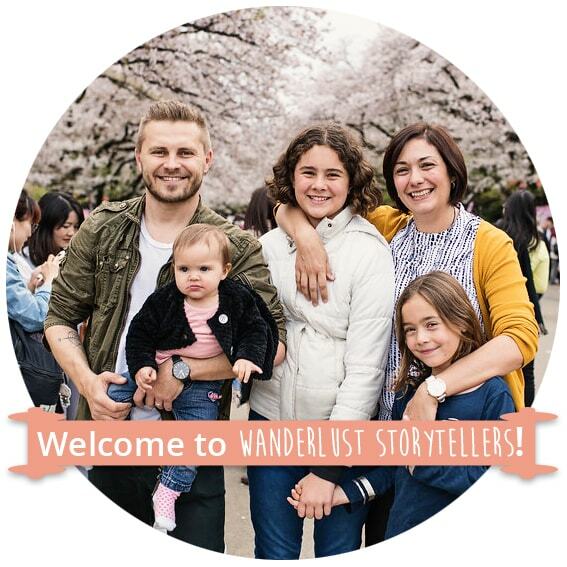 – Visit a Cultural Village and see the Blue Lagoon Tour: A 6-hour tour that includes a visit to the Balihai Custom Village, the swim in the Blue Lagoon as well as some sea turtles spotting at Naiwe Beach. Click here to check prices. 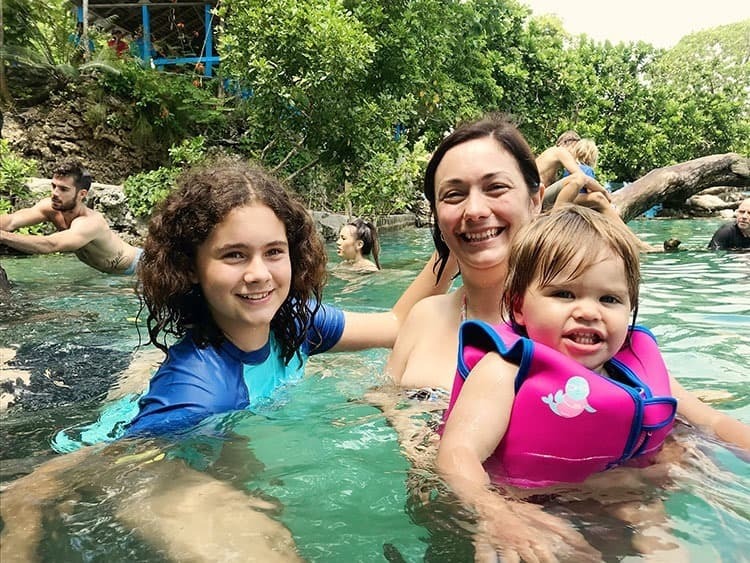 It’s very fair that locals own the lagoon and will charge about 500 Vatu (about $7) per adults and 300 Vatu (about $4) for children below the age of 12 for the entire day. Try to have the exact amount ready as change might not be available. 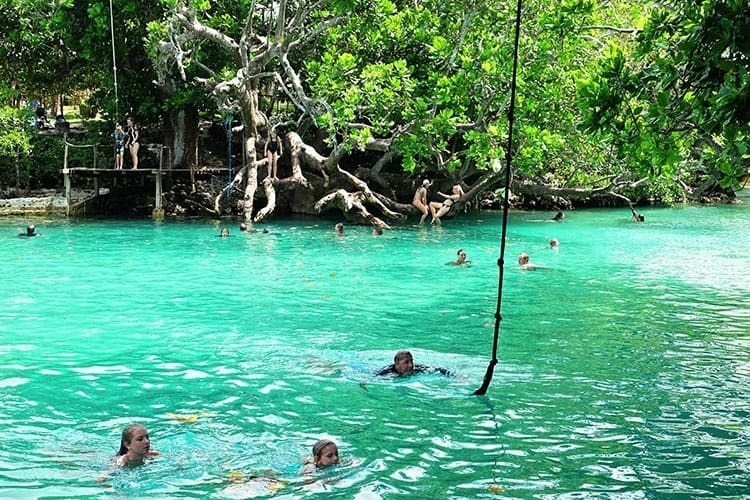 The Blue Lagoon is so enticing and you’d probably want to swim even in winter! You should therefore, bring swimming togs and swimming towels. 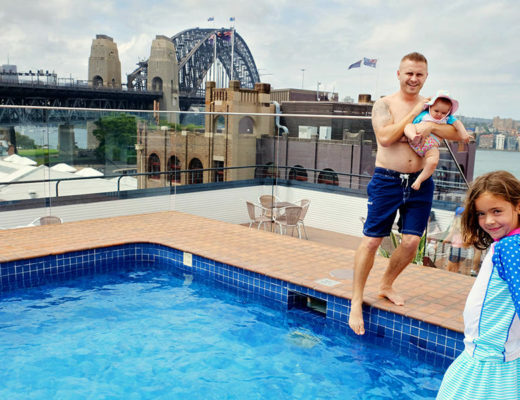 You should also bring floating devices for young kids as the lagoon itself is pretty deep. 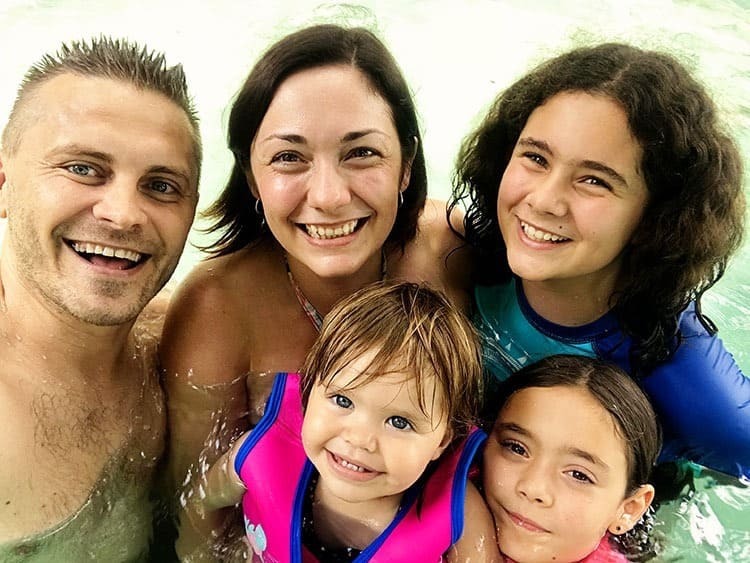 And because you’ll likely want to explore underwater and meet some local fish, you should bring snorkeling gear, as well as a Go Pro or an underwater camera to capture the memories. Keep in mind that there are no facilities offering food or snacks anywhere near the Blue Lagoon and because you’ll obviously want to refuel, it would be recommended that you bring your own lunch, snacks and water. You should also remember that Vanuatu is a tropical destination and there are likely to be lots of sun and mosquitoes. Therefore, carry sunscreen and insect repellents just to be on the safe side. There are two sides of the lagoon as they sides are owned by different families. Essential they both have swings. We prefer to head into the first entrance as you drive from Port Vila to the Lagoon. We found that it has a better atmosphere, it has good facilities, picnic tables, changing rooms, toilet facilities, kayaks for hire and better swings. We also found that the water was pretty cold and got deep pretty quickly. The locals have built a staircase that leads up into the tree. So if you want to try the swing, it is pretty easy to reach and you could choose to swing into the lagoon from a lower or higher level. Also do expect crowds in and around the Lagoon, especially on cruise days. 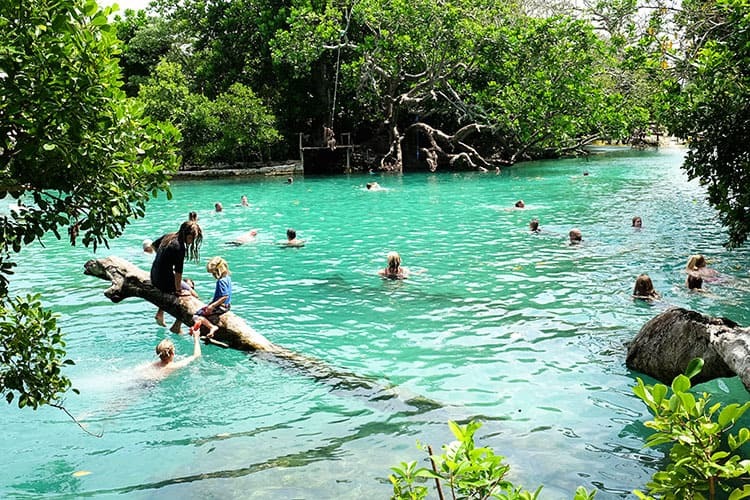 It cannot be doubted that the Blue Lagoon Swimming Hole in the island of Efate is one of the best places in Vanuatu. 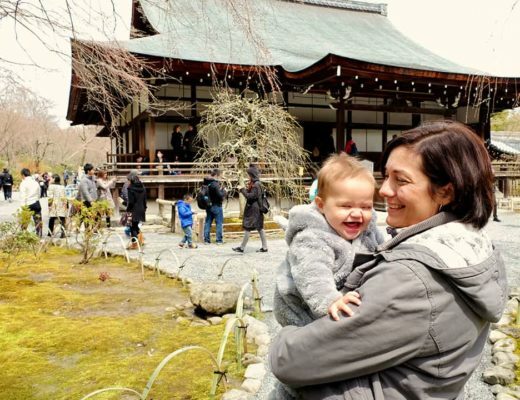 It’s a magical place where solo travelers, families of all sizes and people of all ages. I think the photo on our faces below says it all! 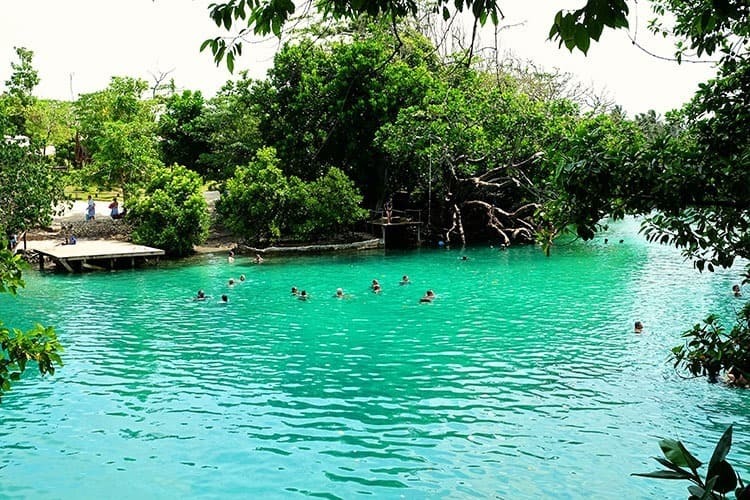 There’s arguably no other place in the world as amazing as the Blue Lagoon of Efate Island: an amazing place to relax, have fun and recharge by spending time in the crystal clear waters. We highly recommend that you set aside at least a half-a-day to enjoy this little paradise on Efate Island. It might even be our favorite place on the whole entire island. 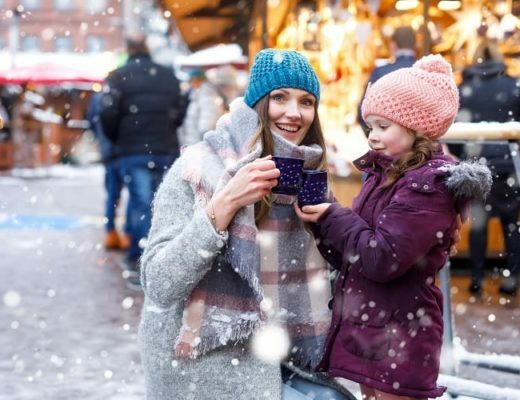 5 European Cities to Visit in Winter with Kids! Wow that does look enticing. We are heading to Vanuatu this year and planning to see as much as we can. The blue lagoon now has us thinking we should definitely look that up during the stay. Looks like you had a wonderful time with the family. Thanks for sharing. Hi Jackie – Jy is welkom 😉 Have a brilliant time. Are you guys going via a cruise or will you be flying over? Jolene – we are flying over. Just trying to organise a tour guide – for an island tour – as feel it will a lot cheaper with all of us. How do you get to the islands?